Welcome to Gyros Protein Technologies’ website. The information provided on this website is for general information purposes only. Please read and review this Legal Notice carefully before accessing or using this website. By accessing or using this site, you acknowledge that you have read, understood and agreed to the following terms and conditions. Gyros Protein Technologies will use reasonable efforts to include accurate and up-to-date information on this website, but Gyros Protein Technologies makes no warranties or representations of any kind as to its accuracy, currency or completeness. You agree that access to and use of this website and the content thereof is at your own risk. Gyros Protein Technologies disclaims all warranties, expressed or implied, including warranties of satisfactory quality or fitness for a particular purpose. Neither Gyros Protein Technologies nor any party involved in creating, producing or delivering this website shall be liable for any damages arising out of access to this website, or any errors or omissions in the content thereof. This limitation includes damages to, or for any viruses that infect your computer equipment. The entire content on this website is subject to copyright protection. Copyright © 2016 Gyros Protein Technologies AB. All rights reserved. The contents of this website may not be copied other than for non-commercial individual reference. Gyros Protein Technologies neither warrants nor represents that your use of materials displayed on the website will not infringe rights of third parties not owned by or affiliated with Gyros Protein Technologies. The trademarks, trade names, logos and service marks (collectively the “Trademarks”) displayed on the website are registered and unregistered Trademarks of Gyros Protein Technologies Group or third party collaborators of Gyros Protein Technologies. Nothing contained on the website should be construed as granting any license or right to use any Trademark displayed on the website without the written permission of Gyros Protein Technologies or such third party collaborators of Gyros Protein Technologies. Your use of the Trademarks displayed on the website, or any other content on the website, except as provided for this Legal Notice, is strictly prohibited. Gyros, Gyrolab, Gyrolab xPlore, Gyroplex, Bioaffy, Rexxip, Gyros logo, Intellisynth, Overture, Prelude, PS3, PurePep , Single-Shot, Sonata, Symphony and Tribute are trademarks of Gyros Protein Technologies Group. All other trademarks are the property of their respective owners. Products and technologies from Gyros Protein Technologies are covered by one or more patents and/or proprietary intellectual property rights. All infringements are prohibited and will be prosecuted. Please contact Gyros Protein Technologies AB for further details. Products are for research use only. Not for use in diagnostic procedures. Products are not for resale. Gyros Protein Technologies has not reviewed the content of all of the sites linked to the website and makes no warranties or representations of any kind as to the content of any such off-site pages or any other sites linked to the website. Your linking to any other off-site pages or other sites is at your own risk. This Legal Notice and your use of the web site shall be governed in accordance with the laws of Sweden. 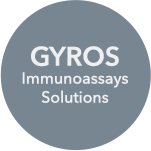 © 2016 Gyros Protein Technologies AB. All rights reserved.